Finally home after a **fantastic** weekend working with such a diverse range of horses and people as Active Riders Resident Horse Barber! Such incredible weather (Jane HOW do you DO it??!!!) I want to thank each person who took the time out of their busy weekend to attend thehorsebarber clipping demo on Friday and gave their very encouraging feedback, as well as people who entrusted me with their precious steeds to give them their make overs! I had a brilliant time and i hope you all did too. Here are just a few of the Early September camp attendees that i had the pleasure of working with this weekend, who were on camp strutting their stuff across three different disciplines; show jumping, cross country and dressage. 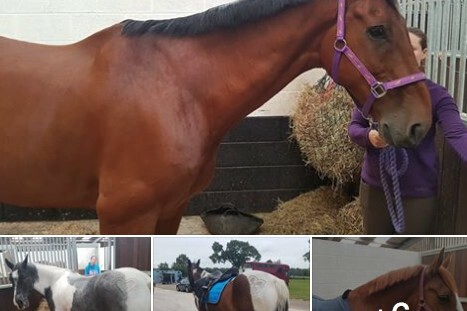 From mane pulls & tail tides to body clips and fetlock shaves! Each horse was an absolute pleasure to work with and i hope you all had a fantastic weekend at camp. Star of the show was Timmie who was an absolute angel of a demo horse, special thank you to all Kerry (Timmies mum) and those who volunteered their horses. As well as the amazing Jane Walker who runs the flawless camps that we love so much! I wish there was more time to speak to everybody a bit more however i will certainly see you again in the future!